Every year for the past seven years, Sydney’s streets and skyline have come alight with the beautiful, inspiring, interactive festival that is Vivid Sydney. The lights and installations of Vivid Sydney illuminate some of Sydney’s most iconic landmarks, including the Sydney Opera House, Customs House, Maritime Museum and The Star casino. In fact during Vivid Sydney 2016 The Star never shone so bright. 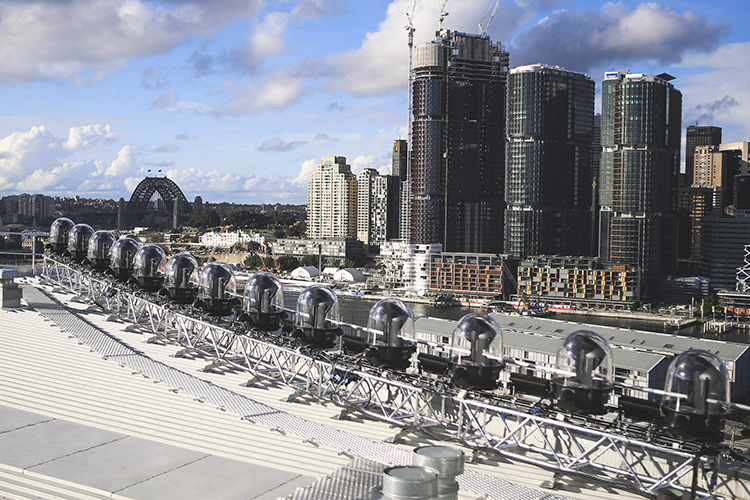 For Vivid Sydney 2015, The Star temporarily installed forty-four Clay Paky Sharpys and ten Mythos fixtures onto their roof as part of an installation entitled Mission Control. 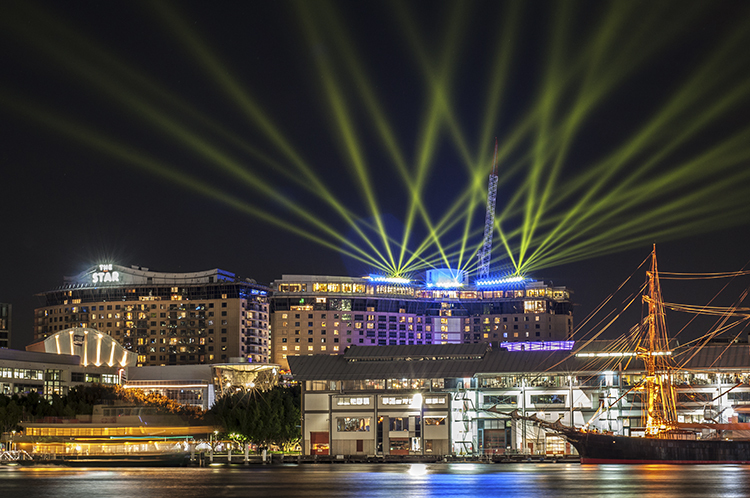 The resulting light display was so stunning and popular, the venue realized there was potential beyond Vivid Sydney. 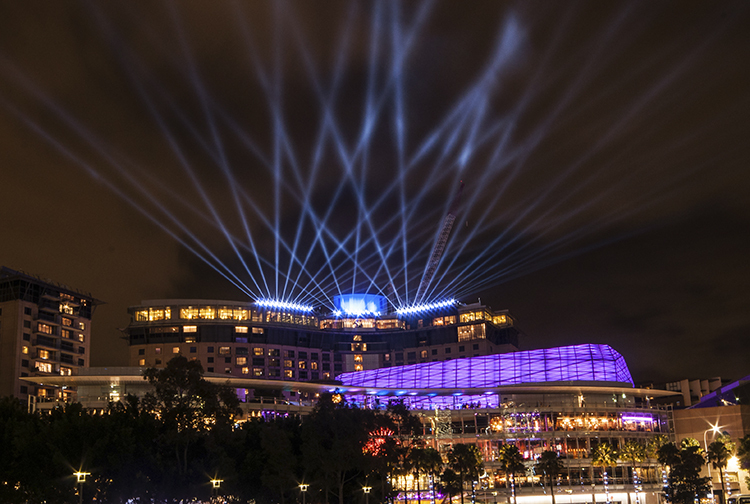 To celebrate VIVID 2016 a total of thirty-six Clay Paky Supersharpys were chosen for their enhanced optical design. Famous for its powerful beam, the Supersharpy produces clearly defined mid-air effects even at long distances. The Supersharpy’s beam angle may be reduced to almost zero degrees by means of a perforated grid which provides a perfectly parallel beam, similar to a laser beam. To protect the Supersharpys from Sydney’s temperamental weather, each fixture is housed within a Clay Paky Igloo, a tough, sturdy enclosure that offers complete protection against rain and humidity, and maintains a perfect working temperature (between 0°C and 35°C) for fixtures even in hot or sub-zero conditions. Thirty-six IP-rated ShowPro LED Flood EX36 are positioned between the Supersharpys for colour wash, thus adding another dimension to the design. Bruce commented that they actually looked at many other IP-rated wash lights but the EX36 really did work for what they needed at the correct price point. The lights are tightly programmed and choreographed with little fast paced movement. Beam angles are carefully controlled so as not to hit apartment blocks, the Harbour Bridge or possibly interfere with air traffic. 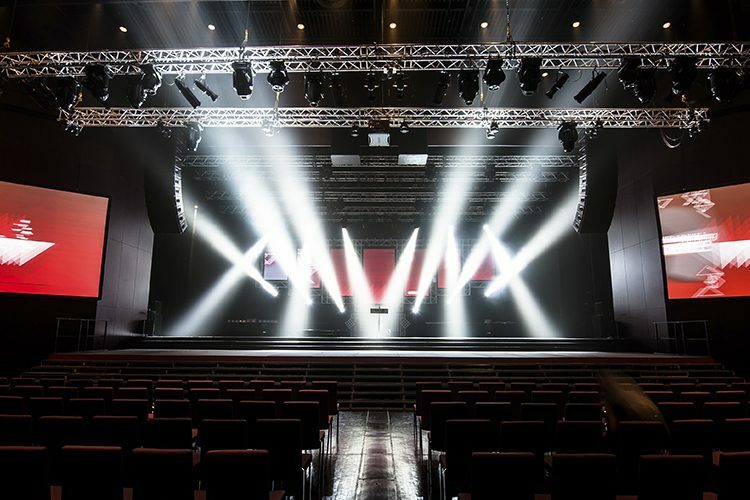 Show Technology supplied a full turnkey solution for this project, with Technical Manager Mike Gearin working closely with Bruce Dwyer to put the system together. RDM has been utilized so every fixture is performing two-way communication back to the computer. Every day the software exports a performance report telling if there is an error in any of the fixtures. The Igloos are not just domes with extraction fans, if the fixture overheats or the unit stops air intake or outtake, the fixture won’t start. Supersharpys also have inbuilt safety system so if it loses data, or is on and stops panning, the fixture just fades out. If the Igloo loses power or data, the fixture returns home and lamps off. PCC Event Services supplied a wireless networking link that allows a MA Gigabit link 400 metres away down at the pier. The project sees the inaugural use of air fibre for lighting networking in Australia: two point to point networking 24 GHz at 1GB a second, 400 metres away. Infrastructure included custom made power distribution from Indu-Electric in Germany, designed to fit the requirements of the project. Essentially, it’s a 12 channel Socapex IP55 Rated Distro with extra 16amp CeeForm auxiliary outputs for Igloos, fans, software which means they can be left on. The entire system is cabled with 16AMP IP65 CeeForm connectors so its water tight and all data connections are in Junction Boxes rather than XLR to keep it water tight. A few days after the installation was completed, Sydney suffered one of its worst storms in history and the entire set up came through totally unscathed. The Star now has such a remarkable and reliable infrastructure, they have incredible scope for future projects and installations that will assist them in their vision of becoming Australia’s best integrated resort.